Rare deluxe edition of Desnos's Map of America. 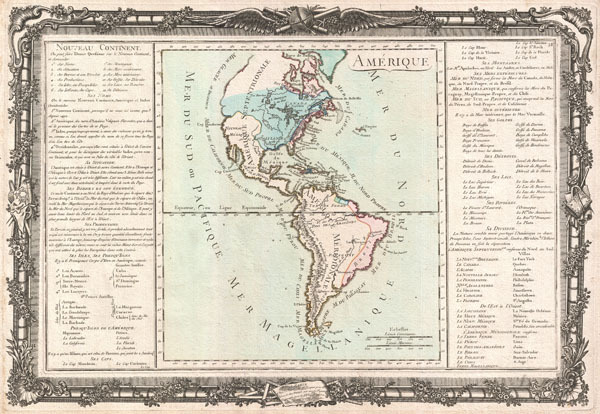 This is an extremely rare example of Desnos and Brion de la Tour's c. 1760 mapping of America. Covers both North America and South America from Greenland to Cape Horn. Overall the general form of the continents exhibit an craggy and exceptionally rugged coast line - a step back from some more advanced maps of this region available at the time. The cartography of North America, particularly the pre-Cook northwest is speculative and indistinct. The cartographer hints at a Northwest Passage via the lake and river systems extending westward from the St. Lawrence, through the Great Lakes, to Lake Winnipeg and the Lake of the Woods. Though the westwards passage is incomplete, a suggestive open inlet does appear just north of Cape Mendocino. This variant on the Northwest Passage was the great unrealized hope of the French Empire in North America, who unlike the Spanish to the south, had no easy access to the trade riches of the Pacific. Identifies the English colonies along the East Coast, in Newfoundland, and around the Hudson Bay. Spanish holdings in Mexico and Florida are also noted. Here the cartographer, a Frenchman, has exaggerated the extent of French Louisiana. A clear case of carto-advocacy and pandering to a constituency. In South America the interior is even more vaguely mapped than in North America. The Orinoco, Amazon and La Plata river systems penetrate deeply into the continent, but exhibit none of the vast network of tributaries for which they are best known. The Rio de La Plata terminates at the Lac Xarayes, a mythical lake often associated with legends of the Earthly Paradise and El Dorado, but in fact simply a misinterpretation of the Pantanal during its annual inundation. To the left and right of the map are statistical tables and French language descriptions of the continents. Surrounding the whole is an elaborate decorative border featuring floral arrangements, surveying tools, elaborate baroque scalloping, and a winged globe. This example comes from an exceptionally rare side bound edition of this atlas, consequently there is no centerfold. Very good. From scarce side bound edition of atlas - so no centerfold! Blank non verso. Original platemarks visible for both map and border.